When did you realise that creating this brand was something you needed to do? Originally the company started under a different name in 2009. It was never a plan to start a company but I always made my own skincare products because I was allergic to the ones readily available. It wasn’t until a good friend suggested I make labels and people started giving feedback on the products that it seemed like coming out with a line would be an important thing to do. In 2011 Earth Tu Face was rebranded as a niche luxury skincare line created by herbalists. The line is plant based, organic and edible. Our gardens are in San Rafael, California while our office, apothecary and flagship store are in Oakland. I formulate our products. We grow organic roses, lavender buds and calendula for our two face masks. Half of the products in the Earth Tu Face line are still hand-made in our apothecary in Oakland each week. The other half is made in a mix and file facility in California where we send ingredients, packaging, labels and they use our recipes to mix and fill in bigger numbers. What was the hardest part of building your brand? Building a brand is fun and challenging. The challenging aspects that stand out have to do with educating the consumer without overwhelming the consumer with information. It is important to get your messaging just right in order to tell your story, explain your products and ethos. It is about educating the consumer without bombarding them with information. For example we find that people are accustomed to a pricing model that works for huge brands that largely don’t use specialized botanical ingredients. When you work with rare, precious, organic, pure plant ingredients and you make things in special containers and small-batch the costs are drastically different from start to finish. It is akin to hiring a woodworker to make a piece of furniture instead of buying one that is made by the thousand. We work on explaining what is better about our ingredients, formulation, packaging, and how it is earth friendly. That informs the cost of the finished products. We also try to get our philosophy out into the world without stating on a soapbox. ). I think we are one of the most lean, mean and green full skincare line out there right now in terms of what we source and use and what we don’t use. What would be your advice to other entrepreneurs who are inspired by your story? Go for it! The world benefits from your creativity and heart. There is room to share your gifts with the world and it eagerly awaits you. *And prioritize self-care. The answer is pretty wonderfully simple: The products are healthy and effective for you and healthy for the planet. They are designed for everyone, especially those that care about thoughtful creation and production integrity. What is the most important ingredient in your products for sensitive skin? Our products are designed for sensitive skin. It is what led me to create my own products a decade ago. We use no nut oils whatsoever and only one seed oil (sesame) in one product (our Face Balm). We use no: soy, gluten, argan, shea, or almond ingredients because they can trigger sensitivities. Our Face Wash is a staple as are our Face Balm and Serums. They help with redness, irritation, eczema, psoriasis and clear allergic reactions from other products. People with sensitive skin have great success with our line in general. What are your top three products do you recommend for the summer season? I love using the body butter because I feel it quenches the thirst of my skin even more than the lotions do, so much so that you will still feel hydrated the next day. We blend organic virgin coconut, organic cocoa butter, sunflower derived Vitamin E and essential oils to promote skin healing, scar reduction and deep hydration. It is great to give skin a lasting boost. For a healthy summer glow I love our Skin Serum. It is great as an after sun oil, a repair serum and daily luminizer. Lastly our Rose + Aloe Toner makes a fabulous refresher, skin setter and after skin sun spray. We hand-make this beauty in our apothecary weekly and it is packed with beneficial botanicals for your skin. We start with a base of rose water, aloe, witch hazel and then add more botanicals like rose absolute, rose geranium and more. It is a company wide favorite. We have a new product in the pipeline so stay tuned… All I can say is it is phenomenal, smells so good you want to eat it (and can!) and is a beautiful pink color. Do you think more people should be investing in all natural beauty products and why? I do. Using gentler, more nourishing products does wonders to change skin of all types. Harsh chemicals strip skin and promote break out cycles or irritated patches which just need more products to heal. I believe in keeping it simple. Simple and healing. We use powerful botanicals that produce results but are tonics to the skin. A gentle and yet effective cleanser filled with balancing plant extracts to remove impurities, followed by moisturizers our skin recognizes from natural sources like coconut, sesame, olive, cocoa butter, safflower and again strong botanicals to reduce redness, bring anti-oxidants, vitamins, and speed the healing of the tissues. It is a win-win for us and the earth. Be sure to indulge in the best nature has to offer by trying out this fantastic brand. This month’s box includes their phenomenal Repair & Hydrating Face Balm for deep hydration and instant radiance. 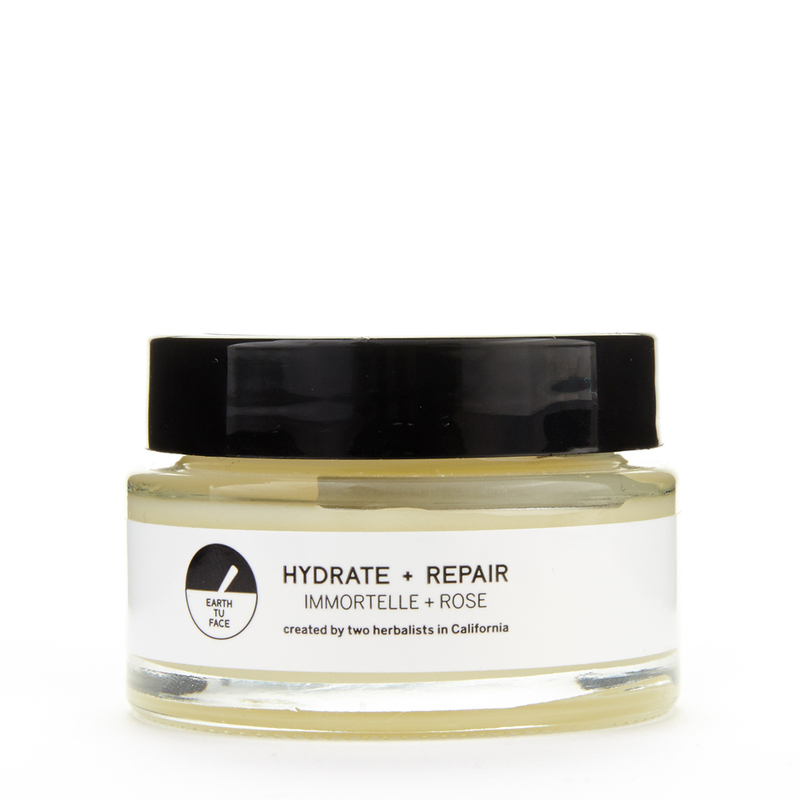 - A delicate blend of Immortelle flowers, Rose Petals and Australian sandalwood in an organic cream base. This formula offers the richest hydration for facial skin and intensive tissue repair. Even the driest of skin will be quenched at the cellular level by premium repair cream.